A 39-year-old black man died last week after an altercation with a Stonewall, Miss., police officer, who allegedly strangled the unarmed father of two with a flashlight during a struggle on a desolate roadside, according to the Daily Mail. Jonathan Sanders, who was unarmed, was asphyxiated during the altercation Wednesday night with Officer Kevin Harrington, who is white, in Stonewall, about 100 miles east of Jackson, the report says. 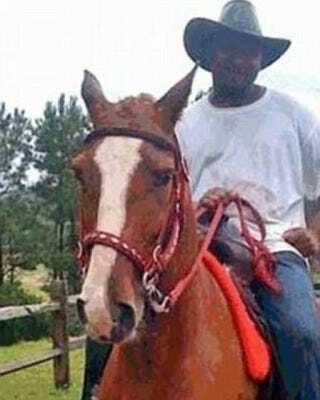 The incident occurred when the officer pulled the unarmed man from a horse he was riding with a buggy, prompting a violent scuffle between the pair, which was reportedly witnessed by Sanders' relatives, notes the news outlet. Sanders' attorney J. Stewart Parrish says that his client was choked to death with a flashlight while asking officers to let him go and stating that he could not breathe, the report says. Police have denied the allegations, the report says. Stonewall Police Chief Michael Street says that Sanders and the officer scuffled after he stepped down from the horse voluntarily, but no weapons were drawn, the report says. The death once again highlights the fractious relationship between blacks and law enforcement. The death bears an eerie resemblance to that of Eric Garner, who died last year after a New York City police officer put him in a choke hold in Staten Island, sparking protests throughout the nation over police brutality and excessive force against unarmed blacks. Stonewall is home to only 1,144 people, according to the Mail, citing 2013 U.S. Census Bureau data, and is named for Civil War Confederate General Thomas "Stonewall" Jackson.